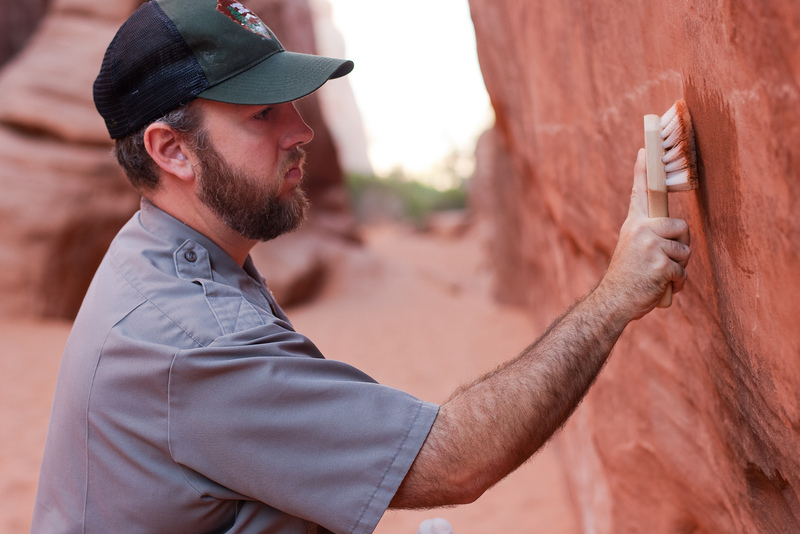 There was a troubling article in the New York Times last week about the growing rise of graffiti and vandalism in National Parks. According to the article, park officials claim that this escalating trend is hard to enforce, expensive to clean up (especially with ever-dwindling budgets), and fueled, possibly, by social media since violators can now quickly share and gawk at their perversions online. Yet, the social media linkage is only speculative; the cause for this rising issue remains unknown. I wonder if the cause is a broader reflection of how perceptions of nature evolve over time. Today “being green” is vogue (and I do not mean that cynically), but our “greening” of the world often remains an incredibly industrialized process. People, young adults especially, relocate to high-tech centers, wear recycled, expensive clothing, eat localized food, and worry, slightly, about climate change. However, this ethos does not necessarily translate into a deeper understanding or appreciation of wild spaces. For the complex symbiosis of an ecosystem transcends all boundaries. There is not a single region of wilderness in the entire world that escapes the impact (for good or worse) of modernization. However, nature is instead perceived as an “other” or something far away. The world is compartmentalize and we sever an important perception…and detach. Perhaps I over analyze? Maybe the attention seeking vandals are beyond any understanding and representative of a fringe counterculture? And other larger issues remain. Development and fossil fuel extraction continues to ring the perimeter of national parks, forming small islands of preservation. Zoos are created instead, and the budgets and personnel needed to manage it are sequestered collateral damage. We also enter a deeply suspicious and cynical era where so many fault the government for all their woes and blast contempt at the very notion of a public good. This all hovers under a blanket of procrastination since major world leaders fail to address epic environmental problems of the day. The graffiti is an ulcer of disappointment. It is hard to understand. Shifting perceptions and a limited appreciation of nature may warp an individual. But whatever the rationale, these violations are also metaphoric signs of pending pressures and looming dangers from much greater vandals. I have an entrenched bias: I believe that a critical study and evaluation of history is necessary for understanding and grappling with where we were and what we aspire to be. Although nuanced in countless ways and perceived and debated to serve whatever purpose, our history breaks and flows in a constant direction of almost scientific quality. The evolutionary spirit bends towards justice, peace, and democracy. Current times seem violent and conflicted, but we should take solace knowing the days of long, epic wars of world powers clashing (hot or cold) seem over. That evolutionary spirit is one of progress. Children grow up today not fearing nuclear annihilation as they did in the 50s and spend less time hovering under desks. Gone too, the era when nuclear testing was a sideshow attraction where tourists rented top floor rooms in Las Vegas hotels to gawk at mushroom clouds glowing and rising in distant deserts of sand and glass. And we should keep learning. Today NPR reported that the US Congress considered national park designation for three sites pivotal to the Manhattan Project. This too should be viewed as a sign of progress-an indication that we transcend a darker past. Although the initial bill failed, proponents hope for a retry. There is a chance these sites will become a national park in the future and it should be designated so, not as a means to glorify or sanitize our history (as was stated by critics), but as a call to action-an opening for healthy debate on how to engage and reconcile our past. Or maybe a reminder of how we came so close to losing it all? Years ago, traveling the dry side of the Sierra Nevadas, I visited the Manzanar National Historic Site in California, one of many designated Japanese internment camps used during World War II. American citizens spend long winters in this high desert locked away without Due Process. American citizens! A shack at the Manzanar National Historic Site. Today much of Manzanar is left for ruin. It is a dilapidated, shadow city of abandon, rundown shacks in perfect rows, beaten hard against long years of open sun, wind, snow, and sand. Rusty metal scraps scatter the site, along with occasional broken shards of glass from old windows. Metals scraps left in the yard. Despite the standard visitor center, the National Park Service leaves much of the site, by design, to decay slowly, untouched. They strike a perfect balance and succeed, reverently, in managing this site and commemorating a wayward era of compromised principles I suspect that the National Park Service would do the same with the Manhattan Project National Park. And we should keep learning.